Well, Chinese New Year shopping leads me to Queensbay, got some stuff I wanted. Queensbay Mall is huge with shopping complexes in four wings. When you want to get something, be sure you know which wing the particular shop is located. Example, the furthest south wing end where Baskin Robbins. That is not difficult as you would have to drive around the roundabout to park your vehicle in the car park. If you happen to be one that loves branded stuff, names like Harvey Norman, Liz Claiborne, Gap, Borders, La Senza, Nike, Hallmark and Tag Heuer. Food, who misses food? Ahhh…patrons sitting down in reputable new fashionable tables and chairs in TGI Friday, House of Paddington and Bakerzin. Baskin Robbins and Starbuck as usual earned their place at strategic wing. So if you are someone who loves shopping in these happening place, Queensbay is for you but me, Chinese folk art by Master Xu led me there. Walking and shopping around the huge mall, it seem no end is in sight until Chandra and I saw a public display of paintings, paper cuttings, museum pieces of figurine and candy blowing. 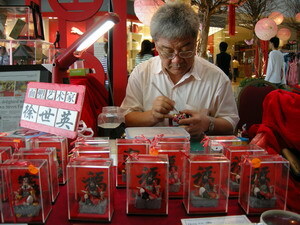 I got fascinated when I saw a Chinese older man patiently and intricately brushing away little figurine. Gosh, he really had such patience. That probes me to move away from my shopping and watch him in action. Read how this made me went back between Queensbay and Gurney to watch their exhibition and display.